Postcolonial lit hero Salman Rusdie was in town Tuesday night to speak to a capacity-filled audience about literature's role in documenting current events. "Literature used to be a way of delivering the news about what is going on," he said. "News has become so unnewslike." Sadden by the current state of TV News being saturated with Britney Spears and Lindsay Lohan, he said that people need reevaluate how they get their information on issues that are really more important. Historically people turned to literature to learn about the hot button issues. He cited Uncle Tom's Cabin and War and Peace as examples. He also said that books can honest about issues that really make people think differently. The Kite Runner was successful because it connected with people about what's going on in Afghanistan. "We live in an age where politicians control the news agenda," he said. "Writers have the opportunity to tell the real news." And sometimes telling the real news can get you into trouble. Rushdie knows this first hand when his controversial novel, The Satanic Verses, was published and had a fatwa placed on him by Ayatollah Ali Khamenei. The publication of the book and the fatwa sparked violence around the world, with bookstores being firebombed. Muslim communities in several nations in the West held public rallies in which copies of the book were burned. Several people associated with translating or publishing the book were attacked, seriously injured, and even killed. Many more people died in riots in Third World countries. From Wikipedia: The publication of The Satanic Verses in September 1988 caused immediate controversy in the Islamic world because of what was perceived as an irreverent depiction of the prophet Muhammad. The title refers to a Muslim tradition that is related in the book. According to it, Muhammad (Mahound in the book) added verses (sura) to the Qur'an accepting three goddesses that used to be worshipped in Mecca as divine beings. According to the legend, Muhammad later revoked the verses, saying the devil tempted him to utter these lines to appease the Meccans (hence the "Satanic" verses). However, the narrator reveals to the reader that these disputed verses were actually from the mouth of the Archangel Gibreel. He has also written less controversial but equally compelling novels such as Midnight's Children, which was about India's newly found nationhood. Rushdie wrote Shame, in which he depicts the political turmoil in Pakistan, basing his characters on Zulfikar Ali Bhutto and General Muhammad Zia-ul-Haq. Shame won France's Prix du Meilleur Livre Étranger and was a close runner-up for the Booker Prize. 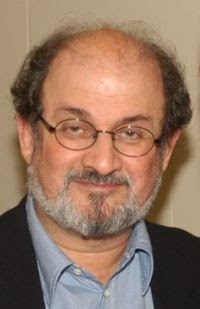 In his later works, Rushdie turned towards the Western world. In the 1980s, he visited Nicaragua, the scene of Sandinista political experiments, and this experience was the basis for his next book, The Jaguar Smile. He followed this with The Moor's Last Sigh, exploring commercial and cultural links between India and the Iberian peninsula. "When a government decided to take over a society , they first take over writers, academics and thinkers," he said. "They do this because literature has no ownership and that is what people see as dangerous." U2 frontman Bono has made a career lately of being the rock star humanitarian, by begging world leaders to give more financial aid to the plight of the poor in the developing world. However, if the reports are true about his secret finances, is he really in a good position to tell people spend money when he is hiding his own money? Is this hypocrisy? U2 Ltd., the Irish band's music publishing company, raked in $30 million-plus last year _ and $25.8 million of it went to five unidentified "employees," according to documents obtained Friday by The Associated Press. Those "employees" are suspected to be the band members and their longtime manager, Paul McGuinness. But U2's public relations firms in Dublin and London refused to confirm that. 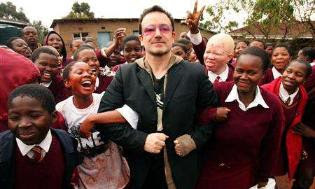 While Bono has won accolades worldwide for raising awareness of Third World poverty, he has been criticized for moving U2's corporate offices out of Ireland to avoid paying taxes. The U2 Ltd. documents show the band moved its corporate base last year from Ireland to the Netherlands, where royalties on music incur virtually no tax. The move, while perfectly legal, strikes a raw nerve in Ireland, whose wealthiest citizens often live as tax exiles in other European countries to avoid tax. It's not known whether the globe-trotting Bono _ who owns a mansion overlooking Dublin Bay _ pays personal taxes in Ireland. U2 Ltd.'s move to the Netherlands coincided with the appearance on its accounts, for the first time, of five "employees." The documents, filed this week at the Irish Companies Registration Office in Dublin, record that the four band members _ Paul "Bono" Hewson, Dave "The Edge" Evans, Adam Clayton and Larry Mullen _ quit the U2 Ltd. board when the company relocated to Amsterdam in June 2006. The documents offered no breakdown of pay to the five. Previous years' U2 Ltd. accounts, produced when the U2 members were still company directors, listed employee salaries as zero. U2 Ltd. said it paid nearly $1.1 million in 2006 tax to Ireland, compared to just $46,500 in 2005. The increased tax bill in 2006 reflects U2's sudden exposure to taxes on royalty income in Ireland. Last year the government _ stung by criticism that its traditional tax-free status for artists was not intended to support multimillionaires like U2 _ capped the tax-free benefit at $360,000 annually. Within months, U2 relocated its corporate base to Amsterdam. The U2 Ltd. documents, reflecting the band's continuous collection of royalty payments for album and music-download sales as well as rebroadcast rights, are unrelated to the band's profits from its most recent worldwide tour. Billboard reported that the Vertigo tour grossed more than $260 million. Bono and the other U2 members regularly make lists of Ireland's wealthiest people. One often published figure estimates their wealth at $860 million, but the figure has proved impossible to document given the band's myriad investment projects and companies. One hundred years ago, 800 concerned African Americans gathered in Faneuil Hall in Boston to discuss the political and social issues afflicting blacks at that time. Topics discussed at the meeting — one of five organized by W.E.B. Du Bois as part of the burgeoning Niagara Movement — included the alarming rate of lynchings of African Americans in the South and the need for a progressive alternative to Booker T. Washington’s more passive, accommodationist viewpoint of African Americans in the post-Reconstruction era. 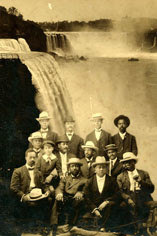 The Niagara Movement became a springboard for many other civil rights efforts to come. Another group of African Americans convened at Faneuil Hall last Saturday, at a gathering organized by the Boston chapter of the NAACP. They came together not only to commemorate the Movement’s centennial anniversary, but also to address problems plaguing the community today. Dr. Robert Hall, director of African American studies at Northeastern University, said that while blacks have made a great deal of progress since the Niagara Movement, many of those complex problems — poverty, unemployment, disproportionate involvement with the criminal justice system and others — are made more complex by the ugly insistence of racism, whether direct or indirect. Hall referenced one example: the recent controversial statements of Nobel laureate James Watson, the renowned biologist and winner of the 1962 Nobel Prize in physiology or medicine for his role in discovering the double-helix structure of DNA. Many panelists at last weekend’s meeting felt that the Jena Six case is an example of the new civil rights movement. They also said that the struggle for social justice is now a global issue, especially concerning the war on terror. The growing number of Americans coming out against the war in Iraq, they said, spotlights a new kind of activism brewing in the country. William Strickland of the University of Massachusetts at Amherst’s W.E.B. Du Bois Department of Afro-American Studies agreed. He said the “imperialistic misdeeds” of the Bush administration have placed the United States in a compromising position on the world stage, citing the U.S. government’s alleged kidnapping of former Haitian President Jean-Bertrand Aristide and Bush’s caustic relationship with Venezuelan President Hugo Chávez. Kerri Greenige of Northeastern University agreed that the American people should force the Bush administration to prioritize its agenda. Even amid these concerns, one troubled the panelists above all: African Americans’ lack of interest in tackling these issues, as their predecessors did years before. They blamed this in part on members of the black community becoming more disconnected from one another. L’Merchie Frazier, director of education at the Museum of African American History, worries most about the dearth of black youth taking on these issues. She said that many African American youth feel that because there were so many achievements resulting from the civil rights movement, there is nothing more to fight for today. Frazier said that when she was younger, her grandmother brought her to civil rights meetings hosted by educator Mary McLeod Bethune when she was growing up in Florida. She urged parents to carry on that tradition today. At meeting’s end, the consensus was that the Niagara Movement’s legacy still has a vital place today, and there is a need to keep this part of history alive for the future. Code Pink protestor Desiree Farooz confronts Condoleeza Rice with "blood-stained" hands, calling the Secretary of State a "war criminal" who should be tried at the Hague. As the U.S. Presidential campaign heats up, all the candidates are worried about their images. Every little thing they do will be scrutinized by now and election day 2008. A week ago Senator Barack Obama became the latest casualty of this. He was asked by a reporter why he doesn't wear an American flag lapel pin. "I decided I won't wear that pin on my chest," he said. "Instead, I'm going to try to tell the American people what I believe will make this country great, and hopefully that will be a testament to my patriotism." Nonetheless, how refreshing! An American politician not using 9/11 for political gain. The following photo was taken from TV commentator and author Keith Boykin's website. 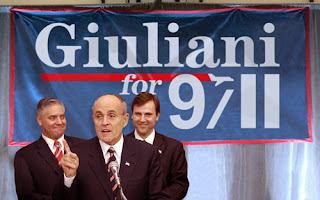 The only reason the former NYC mayor is the forerunner in the Republican nomination race right now is because of his popularity following 9/11 attacks, and it seems like he is milking the tragedy for all its worth. Is it me, or the imagery in the banner of what looks like a plane going into two structures look incredibly offensive? America really needs to reexamine what patriotism really is? 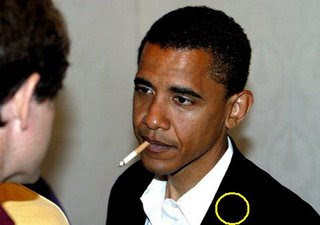 What is more demeaning: smoking, sans lapel pin Obama or terror pimp Giuliani? Reggae music fans worldwide are mourning the tragic death of renowned South African star Lucky Dube. He was shot dead yesterday in front of his children during an attempted carjacking near his home in Johannesburg. As the killer(s) are still on the run, this high profile killing puts another spotlight on violences in South Africa and especially the upcoming 2010 World Cup. During his 25-year career, he has released over 20 albums. As a Rastafarian, he has been quoted as saying that Jamaican reggae superstars Bob Marley and Peter Tosh have been big influences on his musical career. He felt the socio-political messages associated with Jamaican reggae were relevant to a South African audience. What you eat is political. The theme of this year's World Food Day is "The Right to Food." Usually the international community focuses on the billions of people who are suffering from hunger and poverty. But this should also be a day to examine the food that we do eat. Globalization has dramatically changed the way the world gets its food. Half a century ago most food we ate was grown locally. Today food is grown and packaged by corporate farms and shipped around the world quicker than the blink of an eye. While many might see this as an advancement for mankind, it could also be argued that the globalization of food has larger and far more harmful consequences. In the new documentatry, The Price of Sugar, a spotlight is put on the politics of sugar. In the Dominican Republic Haitian migrants are illegally brought into the country to cut cane on sugar plantations. They work long hours for low pay and limited access to healthcare, education and adequate housing and food. If they try to escape, they are beaten and sometimes murdered. Even if they try to escape, they can't go far because they are stripped of their identity when they enter the DR and virtually become invisible. This is modern day slavery. It is even more ironic that it is happening to Haitian immigrants, considering that Haiti was the first nation to abolish slavery in the Western Hemisphere. U.S. sugar policy stands for all that's bad about our political system. The government restricts imports through a series of quotas, pushing U.S. sugar prices to between two and three times the global market rate. As a result, a handful of sugar producers, notably in Florida, a battleground electoral state, pocket $1 billion a year in excess profits. To protect this cozy arrangement, the sugar barons plow a chunk of their revenue back into the political system. During the 2004 election cycle, two Florida sugar companies gave a total of $925,000 to election coffers. This corruption has victims. Producers' enviable profits come straight out of consumers' wallets, so that ordinary supermarket visitors are made to subsidize welfare for corporations. At the same time, efficient foreign sugar producers, many of them in poor countries, are denied a fair chance to export their way out of poverty. Meanwhile there is an environmental cost: In Florida, sugar cane production has contributed to the degradation of the Everglades. Sugar-using industries are losers too. As Kimberly A. Elliott notes in a paper for the Center for Global Development, some candymakers have closed U.S. factories rather than pay crazy sugar prices. Big Sugar is just one, small example of how trade politics can effect how and what we eat. Environmentalist Vandana Shiva has been on the forefront of food justice for years. 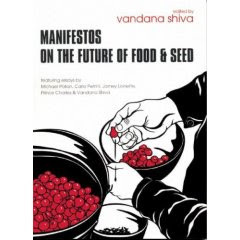 Shiva recently published a book she edit, Manifestos on the future of Food and Seed, which explains the drastic effects of globalization on food sustainability. * 8,000 edible plants are grown in the world, only about 150 are being cultivated for actual consumption, and just eight are traded globally. *The world's industries produce food for 12 billion people when there are only 6.3 billion people living. * 800 million suffer from malnutrition and 1.7 billion suffer from obesity. * Food is modified to travel long distances according to WTO regulations rather than to be nutritious and flavorful. * Food that is considered "organic" is now seen as "rich people's food," as it is usually too expensive to be purchased by the world's poorest. All people should have economic access to safe, fairly traded food. Now that is some food for thought. It was announced this week that two favorites of Global Wire were awarded Nobel Prizes. Former U.S. Vice President Al Gore, along with the UN Intergovernmental Panel on Climate Change, received the 2007 Nobel Peace Prize for bringing worldwide attention to global warming. 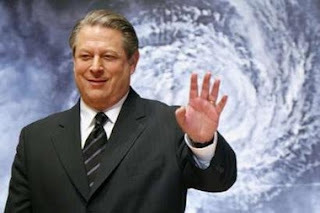 A long-time environmentalist, Gore was award the Best Documentary Academy Award this year for his film, An Inconvenient Truth. This summer he organized the Live Earth concerts worldwide. I am deeply honored to receive the Nobel Peace Prize. This award is even more meaningful because I have the honor of sharing it with the Intergovernmental Panel on Climate Change -- the world's pre-eminent scientific body devoted to improving our understanding of the climate crisis -- a group whose members have worked tirelessly and selflessly for many years. We face a true planetary emergency. The climate crisis is not a political issue, it is a moral and spiritual challenge to all of humanity. It is also our greatest opportunity to lift global consciousness to a higher level. My wife, Tipper, and I will donate 100 percent of the proceeds of the award to the Alliance for Climate Protection, a bipartisan non-profit organization that is devoted to changing public opinion in the U.S. and around the world about the urgency of solving the climate crisis. Check out a biographical article on Lessing's life. British Prime Minister Gordon Brown announced yesterday that his government will be slashing the number of British troops in Iraq to half by this spring, and possibly the rest of the troops will be out by the end of 2008. Brown claims that the reduction is due to the "calmer" situation in Basra, where British troops are currently based. According to yesterday's International Herald Tribune, Brown's rationale is "The Iraqis are now able to take responsibility for the security themselves." It would start with British forces training and mentoring Iraqi security forces, securing supply routes to the Iranian border and being able to provide back-up to local security forces. In the second phase, starting in the spring of 2008, British troops would retain a more limited ability to intervene by force, Brown said. 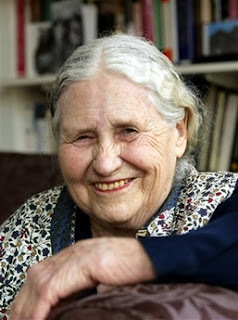 Brown's decision was also determined by the growing anti-war movement in the UK and the British Army. The White House, of course, is not amused by this decision. According to Toby Dodge, a senior fellow at the International Institute of Strategic Studies in London, Washington is feeling "uneasy" about this decision. But Washington has bigger problems on their own shores. In Sunday's Boston Globe, Enlistment of African Americans in the military has declined by 58 percent since 2000. African Americans have had a longstanding relationship with the US military; many of whom saw it as an opportunity get into perks such as health insurance, good salary and way out of poverty. However, after the September 11, 2001 terrorist attacks and the onset of the so-called "War on Terror," African Americans increasing disagree with the Iraq War. Specifically 83 percent of African Americans disapproved of the invasion. In addition, African Americans lack trust in the Bush Administration, especially in light of the preceived dearth of support for victims of Hurrican Katrina. 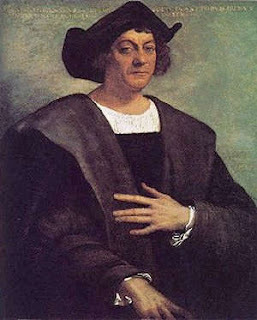 In today's New York Times it is revealed that Christopher Columbus may not be who we think he is. BARCELONA, Spain — When schoolchildren turn to the chapter on Christopher Columbus’s humble origins as the son of a weaver in Genoa, they are not generally told that he might instead have been born out of wedlock to a Portuguese prince. Or that he might have been a Jew whose parents converted to escape the Spanish Inquisition. Or a rebel in the medieval kingdom of Catalonia. Yet with little evidence to support them, multiple theories of Columbus’s early years have long found devoted proponents among those who would claim alternative bragging rights to the explorer. And now, five centuries after he opened the door to the New World, Columbus’s revisionist biographers have found a new hope for vindication. DNA testing is the new craze. It is especially among African Americans who want to know their African heritage. The American history Vy discovered is a common one it turns out. Geneticist Rick Kittles runs a company called African Ancestry that specializes in DNA testing for black Americans. He says a full one third of the men he tests find out they have a white male relative somewhere back in time. How do people who find this out react? "Some black men get upset and say, 'Look, I'm black. Look at me, I'm black.' And you know and I say, 'Yeah, you are. But this small segment of your DNA doesn’t go back to Africa but to Europe,'" Kittles says. "We are a mosaic of many different ancestors. We can go back several generations and there are hundreds of people who, thousands of people who actually contributed to our DNA...Kittles' company has amassed the largest database of DNA sequences from countries in Africa, particularly those from which slaves were taken. His goal is to help American blacks trace their ancestry back to Africa, a history totally lost to them. "If you think about young African-Americans growing up, thinking that their history started with slavery. I mean how do you think that that impacts their psyche?" Kittles wonders. "You know, we went through slavery, we didn't start with slavery." While all the kinks in DNA testing have not been straightened out, at least it's a good start to finding one's true genealogy. Everyone has someone they look up to as an idol, whether it is a Hollywood actor, a high-profile politician, or just an ordinary person who did something extraordinary. But what if you had the chance to meet your idol and they turned out to be something you didn’t expect? Filmmaker and journalist Lina Makboul had this experience when she met a not-so-ordinary person: Leila Khaled, the world’s first female hijacker. Growing up as a Palestinian in Sweden, Makboul admired Khaled as a strong, beautiful Palestinian woman who would make the ultimate sacrifice for the cause of her people. In the film, Makboul describes how, unlike the Palestinian men that Makboul thought just sat around and complained about the loss of their homeland, Khaled channeled her frustration to action. Khaled was born in the Israeli city of Haifa, but her family moved to Lebanon while she was still very young. As a teenager, Khaled was swept up in Egyptian President Gamal Abdel Nasser’s radical Pan-Arabist movement during the 1960s. 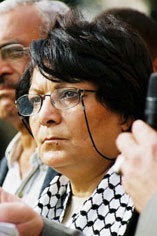 However, feeling disillusioned by the 1967 Six-Day War, Khaled felt she needed to take stronger measures and joined the left-wing Popular Front for the Liberation of Palestine (PFLP). She embarked on her first hijacking in 1969 with a team aboard Trans World Airlines Flight 840 on its way from Rome to Haifa. It was believed by the PFLP that the late Israeli Prime Minister Yitzhak Rabin, who was the Israeli ambassador to the United States at the time, was on the plane. (Rabin decided against flying at the last minute.) The flight was diverted to Damascus, Syria, where the plane was evacuated and blown up. Because of her immediate notoriety following the hijacking, Khaled went into hiding and had several plastic surgeries to conceal her identity. The following year, Khaled hijacked another plane. This time, it was El Al Israel Airlines Flight 219 from Amsterdam to New York with Nicarauguan American partner Patrick Argüello, part of a coordinated PFLP effort to hijack and fly four planes to Jordan. The plot was foiled when sky marshals killed Argüello, and Khaled was subdued and taken into custody in London, where the plane was diverted. A few weeks later, she was released by the British government in a prisoner exchange. Today, Khaled is still involved in Palestinian advocacy, albeit in a more scaled-back manner. She gives speeches around the world on gender roles in Middle East politics and is a member of the Palestinian National Council. A retired teacher, Khaled now lives a relatively quiet life with her husband and two sons in Amman, Jordan. It’s amid this comparative tranquility that Makboul’s film picks up. While they smoke cigarettes and chow down on shish kebabs, the filmmaker interviews Khaled about her past and her thoughts on extremism today — though, Makboul notes, the subject did have some reservations about the project. In the film, Khaled says that she doesn’t approve of hijacking as a form of protest today, although she is still troubled by Palestinian-Israeli relations and feels that Palestinians are still not given equality in the peace process. Asked about the Sept. 11, 2001 attacks, Khaled immediately comdemns the hijackers, saying she was upset by the large number of civilian deaths. The tone changes, however, when Makboul asks if Khaled considers herself a terrorist, and if she had any remorse for the hijackings in which she participated. Without missing a beat, Khaled says she has no regrets, that the hijacking was necessary at the time to turn the world’s attention to the Palestinian struggle. Makboul said she was struck by this answer, and it made her reevaluate the way she saw her idol; while she agrees with international law’s support for those that defend themselves against occupation, Makboul thinks that civilians have rights, too. More than that, Makboul now thinks that Khaled’s lack of remorse gives Palestinians a bad reputation. Two pilots, a flight attendant and a passenger who were hostages during Khaled’s hijackings share the same sentiments in the film. On the other hand, Khaled’s Palestinian neighbors interviewed in the film believe she is a freedom fighter and her actions were right. Despite the moral confusion, Makboul says that she really likes Khaled, and that the two remain friends. Makboul hopes that by presenting a portrait of Khaled as both human and hijacker, her film can contribute to a balanced discussion about Palestinian-Israeli relations. But when it comes to viewing Khaled as an idol? “I stopped having heroes a long time ago,” Makboul said. Former French Finance Minister Dominique Strauss-Khan was officially selected Sunday to become the 10th Chairman of the International Monetary Fund (IMF). The only other candidate to head the fund was Josef Tosovsky, a former prime minister of the Czech Republic, who had the backing of Russia. In a press conference yesterday, Strauss-Kahn has vowed to reform the institution to be more relevant and useful in today's global economy. He also said that the fund will have to reduce its size and functions and improve equality of country representation. "I defined myself as the candidate for reform," he said. "Now I'm the designated managing director for reform. What I want to do after November 1 is to really be the managing director for reform," he declared. After long battle for the position, Strauss-Kahn won over the support of the EU and the United States, natural supporters of the institution. US Treasury Secretary Henry M. Paulson Jr. said that Mr. Strauss-Kahn, who was nominated by French president Nicolas Sarkosy, “will work to make the bold reforms necessary” at the fund, which provides technical financial advice and on occasion helps rescue countries in balance-of-payments crises. He is also supported by most of Africa. Strauss-Kahn met with the African govenors to the IMF in August. In a statement Mozambique finance minister Manual Chang said the governors were impressed with his ideas and looking forward to making his reforms a reality. "They welcomed his commitment to put Africa at the center stage of the reform process, to have regular consultations with them at the highest level, and to take into consideration their concerns should he be selected as Managing Director of the Fund," Chang said. A long-time politician in French Leftist politics, Strauss-Kahn sought the nomination in the primaries to the Socialist presidential candidacy for the 2007 election, but was defeated by Ségolène Royal in November 2006. 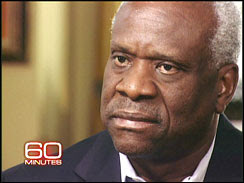 On the US program 60 Minutes last night, Supreme Court Justice Clarence Thomas was interviewed about his role in the court and his relationship (or lack thereof) with the African American community. For years Thomas has been a lighting rod by those in the black community who feel that he has sold out the race with court opinions that many think hold back minorities, most notably affirmative action. In contrast to this idea, when he was asked if he cares about black people, Thomas said he loves helping them. "Do I help, love helping black people? Absolutely," he said. "And I do. But do I like helping all people? Yes. In particular I like helping people who are disadvantaged, people who don’t come from the best circumstances. Do white people live in homeless shelters? Do Hispanics live in homeless shelters? Is disadvantaged exclusive province of blacks? No." During his controversial confirmation hearings 16 years ago, Thomas is adamant that his "high tech lynching" for being an "uppity black" was largely due to his views on abortion. According to the 60 Minutes report, Thomas believes the issue of abortion is not addressed in the Constitution and should be left to the states to decide. If that were to become the majority opinion on the court, abortion could be outlawed in 40 percent of the country. According to his new book, Thomas says that he personally has mixed views about abortion. "There are tough decisions we have to make in life. And of course, we all feel about that. People think that because you might agree or disagree with them on certain things, that you don't have that concern about people who are left with tough choices. You do have that concern. But none of that had anything to do with what's in the Constitution. The point is simply this. The Constitution is what matters. Not my personal views, whatever they may be. And I don't go around expressing them on that issue," Thomas says. Nonetheless, his personal views on abortion should matter. If he "loves helping" black people so much, he would know that if abortion becomes illegal, even in 40 percent of the country, black women will be the most affected by it. According to the Philadelphia Black Women's Health Project, 43 percent of all American women will have at least one abortion by age 45. However, black women are approximately twice as likely to have an abortion as White women. Women who are most likely to have an abortion are Black women aged 18-24 who are either separated or unmarried and have an annual income of less than $15,000, or have Medicaid. If the abortion were to be made illegal by the now majority conservative Supreme Court, America would reverse to a pre Roe v. Wade culture where women go to back alleys to endure shady and sometimes lethal abortion procedures. The worst thing about this is that the women going to these back alleys will most likely be low income white women and women of color. So, if Thomas really cares about helping people, he should use his powerful position to actually prove it.